Homer is Known as the "Halibut Capitol Of The world". With its ease of access to fishing via its spit location, you can be out on the big blue in no time. Homer is a fishing town surrounded by beautiful glaciers and heavy coastal timber. Sea otters can be observed by the hundreds and thousands of shorebirds are visible at any one time. 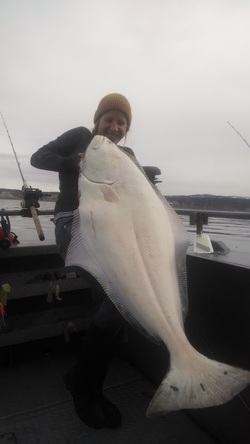 Halibut is probably the most preferred and sought after fish in Alaska. This is one of the true Alaskan adventures that can also make you every ones "best friend" when you get back home! !